Casa Rafaels makes a change from the busy hotels you can be used to staying in when you're on vacation in Cabo San Lucas. 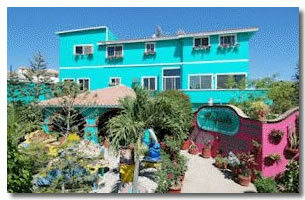 It's a colorful Cabo inn surrounded by tropical gardens. It used to be just a home for one family but has developed over time into a small piece of paradise. Along with the tropical garden you'll see the tropical wildlife. They have colorful birds that sing throughout the day, and Rafaels has tropical fish as well for an extra touch. Rafael himself owns Casa Rafaels, and works at this Cabo inn so you know everything is going to be just right, and that includes the rooms. There are 10 of them in all which makes this a relaxing place to stay as there aren't a lot of other people on the premises on vacation. 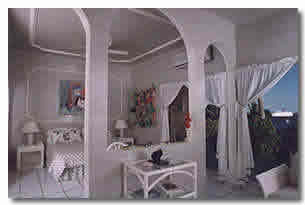 All the rooms are slightly different at Casa Rafaels in look so it would be best to find out what your room looks like before you go. For such a small place to stay compared to some of the resorts here in Cabo San Lucas, Casa Rafaels has a lovely restaurant. It's open to the public as well as the guests. You get a good choice of food. As good as it was though we only sampled the food here once because there is so much variety with the restaurants in Cabo San Lucas. After a long day enjoying some Cabo San Lucas Activities it was good to have a massage booked. You can have some beauty treatment as well in the salon by appointment.